AeroSpaceNews.com is proud to offer TILTROTOR AND THE FUTURE, the first and only independent documentary about the controversial high tech V-22 Osprey Tiltrotor aircraft. FREE BONUS! When you download our tilt rotor history documentary from the link above (and at the great new low price), you also get the V-22 Osprey picture below in full HD resolution, perfect for your computer's wallpaper on large screen high definition displays! 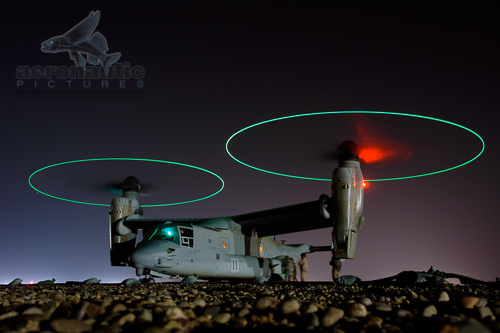 Tilt rotor documentary bonus V-22 Osprey picture! Currently front page news, here is your opportunity to learn the inside story about this remarkable hybrid aircraft's origins and how it became the V-22 Osprey. Industry insiders and flight buffs alike will be fascinated by expert discussions of the engineering challenges posed by the tiltrotor concept. TILTROTOR AND THE FUTURE takes you from the early days of tactical helicopter deployment in Korea and Vietnam into the cockpit of the NASA XV-15 and the promising but troubled V-22 Osprey. Experience breathtaking scenes of air-to-air combat tests, search & rescue, and air-to-air refueling missions. Step inside the state-of-the-art Osprey simulator and see tomorrow's amphibious air-assault workhorse in action! Get your own high quality digital copy (for downloading and unlimited personal future viewings) at our new low price of only $19.95 through the "Buy Now" buttons on this page and you can be watching this exciting show in just minutes! Be sure to watch the short preview below to see the amazing footage in this hour long film of the 1950s vintage X/V-3, the 1970s era flight tests of the XV-15, and interviews with V-22 Osprey program leadership. Tech Tip:To enjoy the download edition of the program you must have the free Windows Media player, Version "9" or later, installed on your machine. Information on how to get or update your free player is here. Ready to download your personal copy for our new low price of only $19.95 - which includes a full year subscription to AeroSpaceNews.com? Great! VISA (credit or debit), MasterCard (credit or debit), American Express, Discovery all accepted. TILTROTOR AND THE FUTURE was produced from rare historical footage combined with computer-animated simulations and exclusive interviews with experts in this cutting edge flight technology. An hour-long, in-depth look at this remarkable aircraft, TILTROTOR AND THE FUTURE is a must have for every serious aviation video collector. Produced in 1987 by the award-winning filmmaker who publishes AeroSpaceNews.com, you must not miss this extraordinary documentary. Get your copy free with your paid subscription now! Please note that this program was produced in 1987. In the event of a defective download, we will can only troubleshoot the download. Please be certain your system meets the technical requirements. Thank you for your interest and understanding. The show is only available at this time in Windows Media 9 format. file sizes, you must also have a broadband connection (DSL or cable). to "go live" on our server. If you'd prefer to have a DVD of Tiltrotor and The Future, without any subscriber benefits, please click here to order. open the files - no lost packages or shipping delays, plus all the exciting new aviation videos we are adding throughout the year! hour long show in just about 1/2 hour. broadcasting or reproduction is permitted. Is the enjoyment of our exclusive 60 minute aviation documentary video on the secrets of the V-22 Osprey not enough to convince you to subscribe? Then perhaps our bonus offers will entice you. Please continue the preview tour to learn more. Sure a 60 minute aviation documentary video on the secrets of the V-22 Osprey is a great deal when it is included with your annual paid subscription, but did you know you also get the following video, audio and service bonuses too? High Bypass jet engine technology featuring expert comments by Douglas Aircraft and General Electric jet engine flight test engineers, and Michael Dornheim of Aviation Week and Space Technology. every picture seen in this animation. #4 - NEW! You'll see the exclusive turning and burning music video flying montage of our mission aboard a Sikorsky/US Marine Corps CH-53E Super Stallion Helicopter that goes wrong. It includes never before seen on television footage from a live fire exercise and you'll see as the tip of our refueling probe snaps off in flight while we were tied to a MC-130 Hercules - it was a hairy experience all caught on tape! (coming soon - see the screen captures above for highlights) Of course, subscribers will also have instant access to other exciting and exclusive videos we add throughout their annual paid subscription. #5 - Paid subscribers get instant access to our podcast archive of half hour radio interviews like those with Jim Maser, president of Sea Launch, Réal Levasseur, Investigator-in-Charge (IIC) of the Air France Flight 358 Airbus A-340 accident at Lester B. Pearson International Airport in Toronto, and active duty test pilot students inventing autonomous air-to-air refueling technology. #6 - Any time during your annual paid subscription you can place a free 50 word classified ad to sell that car, airplane or old flight jacket. Ready to launch? Great! Click the "Buy Now" button below and you are on your way. And thanks!